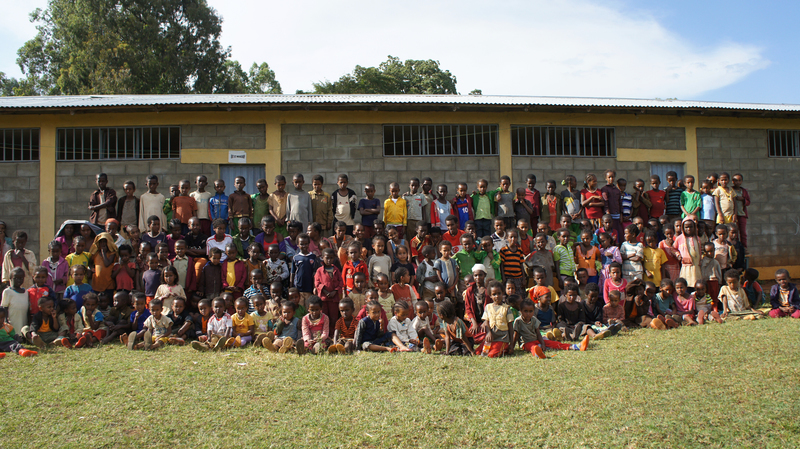 We are excited to share that Stand by Me has opened a brand new school in Dembi Dollo, in Ethiopia, and on 15th November 2013, 240 eager children and their families attended the opening ceremony. The classrooms are now buzzing with the excitement of the children enjoying their lessons and forming new friendships. Our plan was to initially build four classrooms and begin a small school for the most vulnerable children in the area. However, God intervened and Stand by Me recently had the opportunity to purchase an existing school with an estimated value of over £300,000, for just £74,000. This was a wonderful day as not only does the school have 24 classrooms, nine acres of land, running water and an electrical supply, it was also in good condition so we have been able to open the school much sooner than we anticipated. This means we are now educating and caring for more children faster than we had hoped possible, bringing them the love of Jesus, hot meals and a good education. The development of the school has continued at a fast pace and within weeks, the neediest children in the town have been identified and enrolled, and they have all been tested for HIV and checked for existing health issues. We are very impressed with the new staff and also the willingness of the people of Dembi Dollo to help us open our new school. On the opening day, the children were delighted to receive a small bag each and an opportunity to select a gift from the table in the classroom. It was a new experience for many of them to be offered items such as chocolate, lollipops, underwear, fruit juice and balloons. When they realised they were allowed not just one item but something from each table, their eyes lit up and they began eagerly filling their bags with their special treats. Today the children are attending school and receiving a good education and a hot meal each day, thanks to the generosity of our supporters. Thank you for helping us to open this new school and make a difference in the lives of these children. We are now ready to begin a sponsorship programme in Dembi Dollo and we are currently in need of 190 new sponsors. If you would like to know more about this please visit our child sponsorship page today. "Today I got another A"